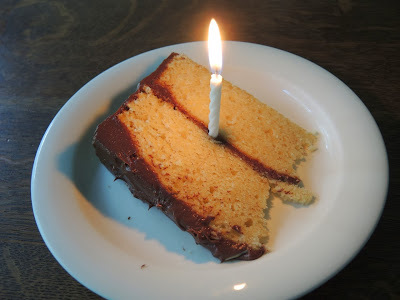 It seems only fitting to celebrate the first anniversary of Kitchen and Cake with a cake. This past year had been such fun sharing recipes and life in and out of the kitchen with you. Readers from all over the globe have visited my blog. 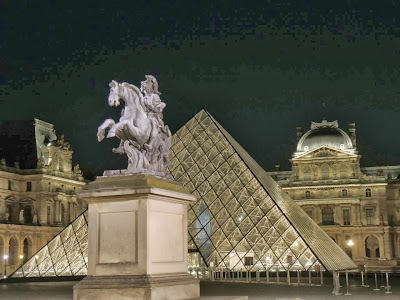 I do hope you enjoy it and will continue to visit and share it with your friends. Thank you! This cake is a classic in our household. When we aren't quite sure if we are in the mood for vanilla or chocolate, (personally I'm always in the mood for chocolate) this is a nice compromise. 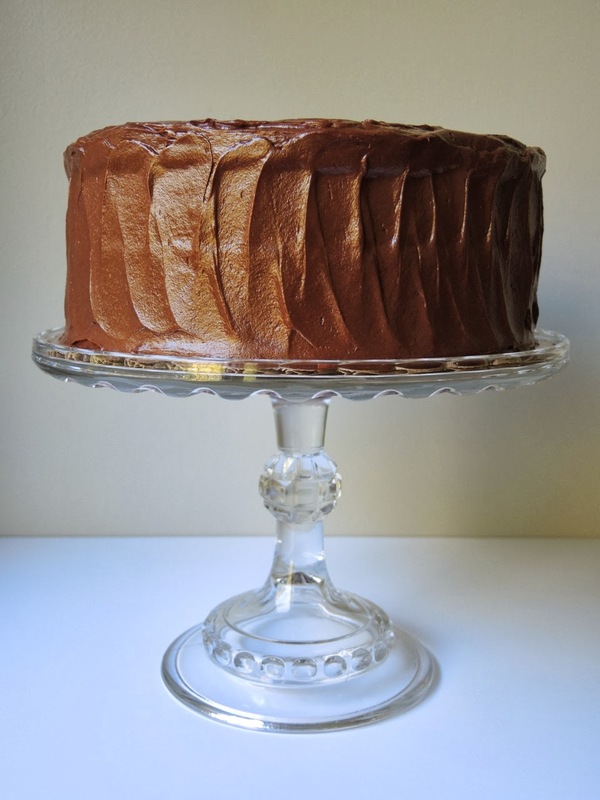 The cake has a rich, buttery vanilla flavor thanks to a generous tablespoon of vanilla extract. Make sure to use the best quality butter and vanilla since they are the stars of the show. The chocolate frosting has a tendency to make people swoon. The whole combination often moves the room to silence punctuated by utterances of mmm. Start with butter and eggs that are at room temperature, so the butter is nice and soft. Cream the butter and sugar until light and fluffy. Add the eggs and vanilla scraping down the bowl a few times to make sure the batter is well mixed. Alternate adding the sifted, dry ingredients and the buttermilk with the mixer on low speed, so you don't create a plume of flour dust or splash buttermilk all over the place. 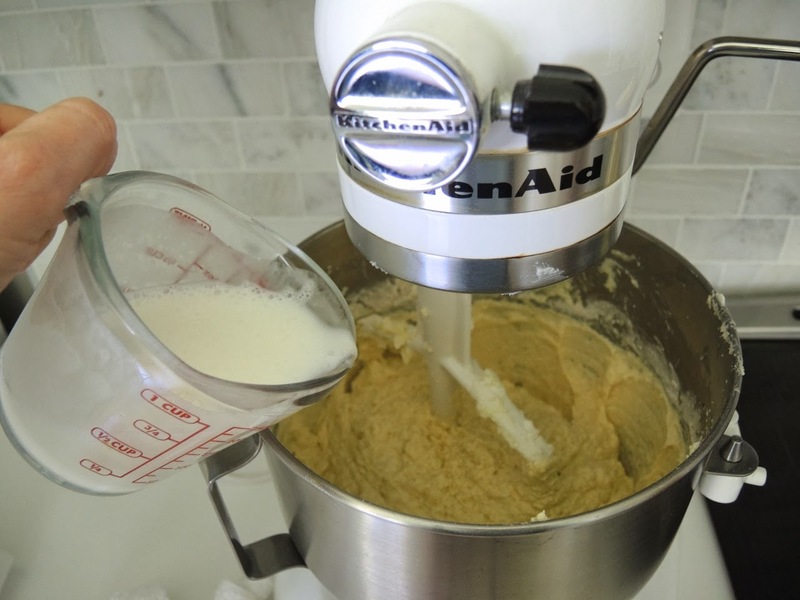 Be careful not to over-mix the batter, so the cake texture stays soft and tender. Bring cream, corn syrup, and butter to a simmer stirring to combine. Add chocolate and stir until melted and smooth. Don't be concerned about the small amount of corn syrup. It helps give the frosting a luscious, creamy texture. It is not high fructose corn syrup, just regular old light corn syrup. 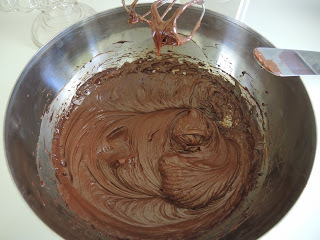 Allow the chocolate mixture to cool completely before beating with a mixer. Beat until lightened and holds a soft peak. Fill and frost the cake. Preheat the oven to 350℉ (175 ℃). Butter the sides and bottom of 2, 9-inch (23-cm) round cake pans with softened butter then line with parchment paper and dust with flour. Cream softened butter and sugar on medium speed until light and fluffy, 3-5 minutes. Reduce speed and add eggs one at a time, scraping down the bowl a few times. Mix in vanilla extract. Sift together flour, baking powder, baking soda, and salt. Alternate adding the dry ingredients with the buttermilk in three parts with the mixer on low speed. Mix just until combined. Scrap down bowl once or twice, but don’t over mix. 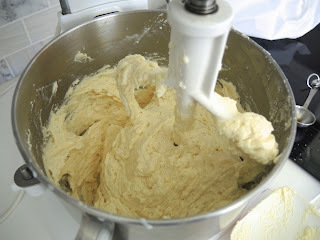 Divide the batter evenly between the two pans. 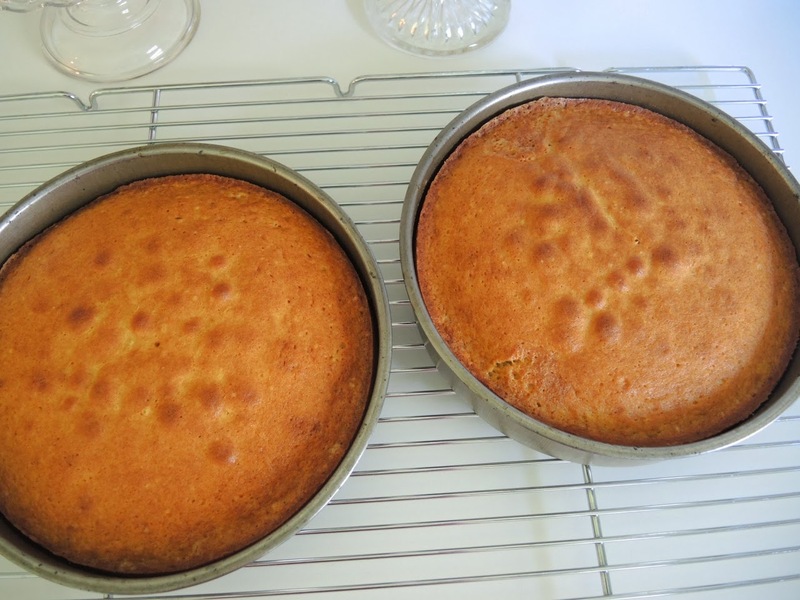 Bake on the center rake for 35-45 minutes, until a tester comes out clean. Cool cakes in the pans on a baking rake. Remove from pan and frost with Fabulous Fudge Frosting when completely cooled. The cakes without frosting may be cooled, wrapped tightly and refrigerated for a few days or frozen for a few weeks. Defrost before icing the cake. 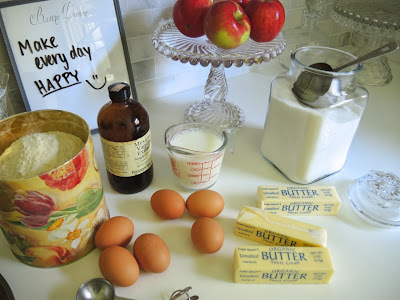 Combine cream, corn syrup, and unsalted butter in a large saucepan. Stir over medium heat until mixture starts to simmer. Reduce heat to low and add chocolate. Stir until smooth. Remove from heat transfer to a large bowl to cool. 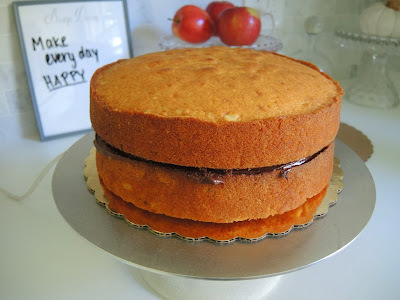 When completely cool beat with a hand-held mixture until frosting is thick enough to hold soft peaks. 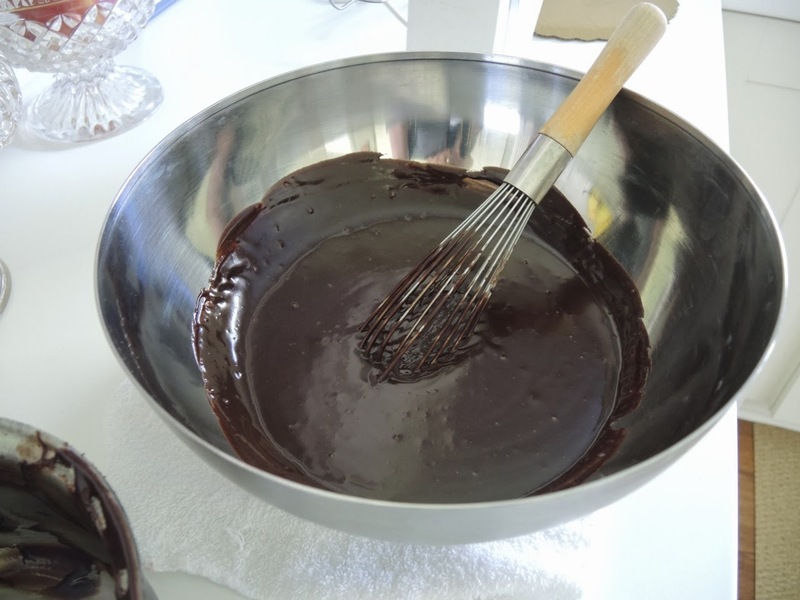 If you need to speed the cooling process you can stir the chocolate mixture over an ice bath remove before beating with the mixer. I wish I could share a slice with each and every one of you. Enjoy! 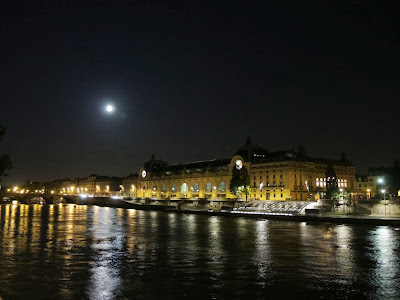 There are few things more magical than Paris at night especially when the moon is full. 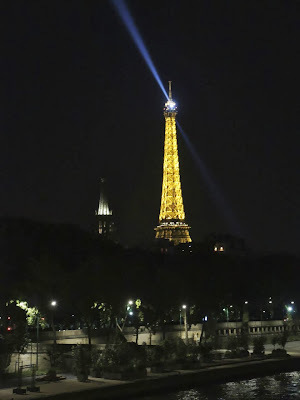 We did not want our last precious hours to end, so after a memorable meal at Au Pied de Fouet, a tiny bistro near our hotel, we wandered around Paris until our feet would no longer carry us. 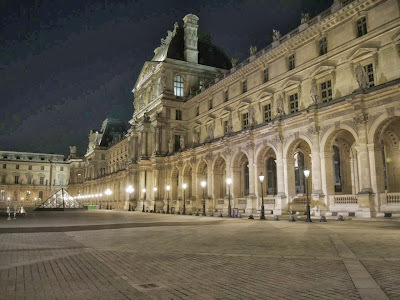 The crowds of the day had long gone to bed leaving us to savor Paris alone. When I was a child my favorite book was Goodnight Moon, by Margaret Wise Brown. I loved how everything in the room was told good night before going to sleep. 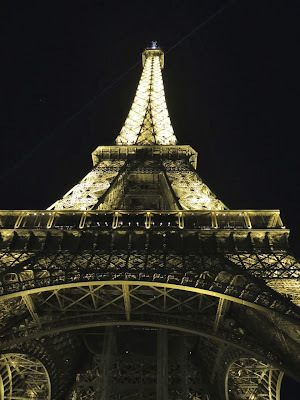 Our adventure around Paris took us to all my favorite monuments to bid them farewell. 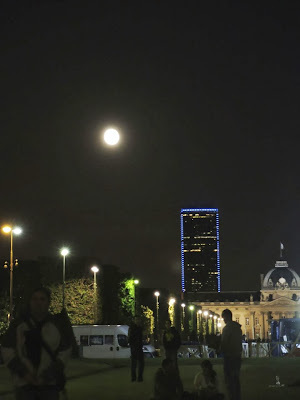 The often criticized Tour Montparnasse's monolithic appearance is slightly softened by the outline of blue lights and the giant pearl moon hanging over head. When I added the link for Tour Montparnasse I came across this link for Airbnb. I had read about Airbnb and thought what a great idea. The next time I travel I will definitely consider this service. My favorite bridge in Paris is Pont Alexandre III. Beautiful by day, it is especially charming at night. 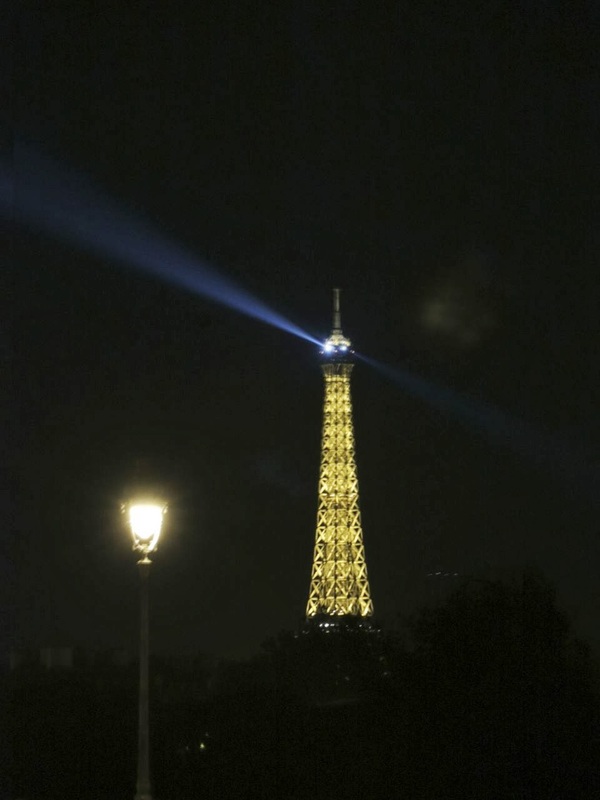 I try never to miss seeing it when visiting Paris. The view of the Eiffel Tower from it is quite pretty. Walking across this lovely bridge makes me so happy. 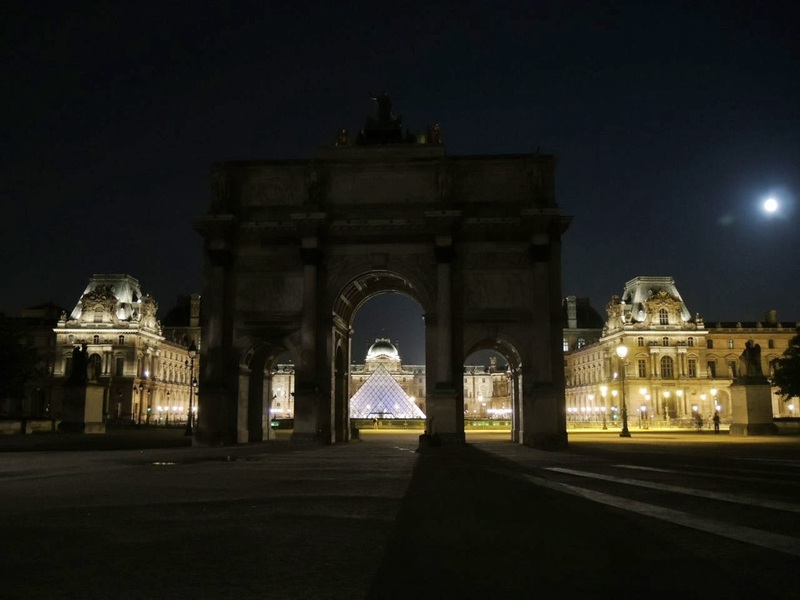 The Champs-Élysée is always full of life no matter what the hour which makes it hard to say good night, but the Louvre was all but deserted and ready for slumber. 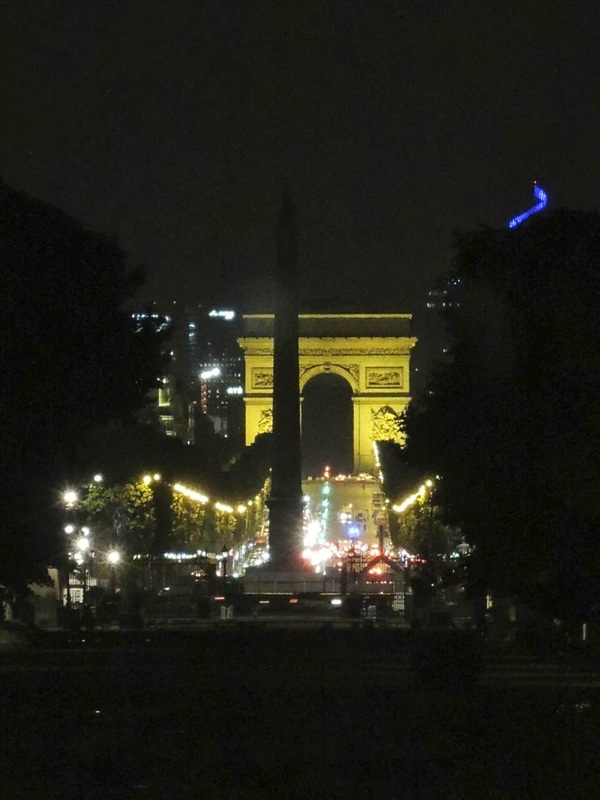 After being in the warmth of Croatia, Paris was unseasonably chilly. 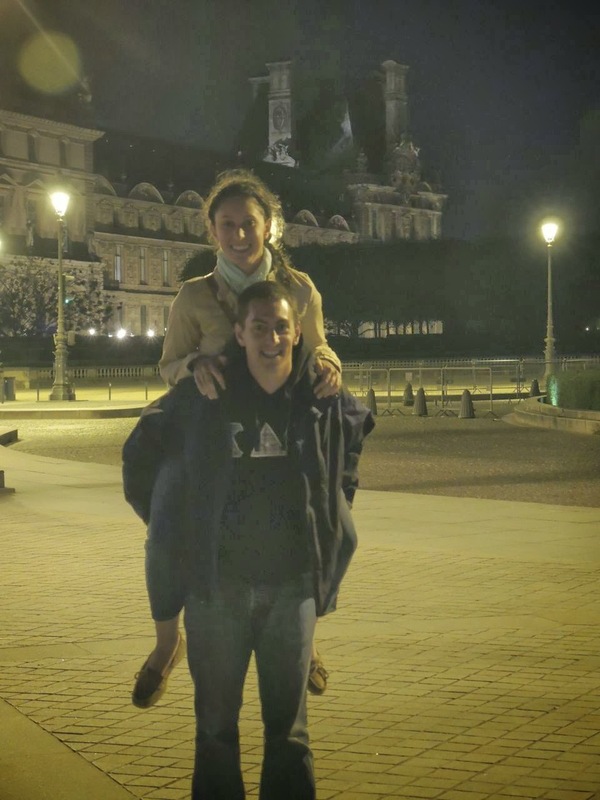 We put on our warmest clothes for our excursion around Paris. Addison gave Maddie some relief from her tired feet. They were good sports as I snapped photo after photo. When the architect I M Pei was commissioned to create a new entrance for the Louvre in 1984 the resulting pyramid caused quite a stir. People either love it or hate it, but everyone seems to hold an opinion. Personally, I like the juxtaposition. 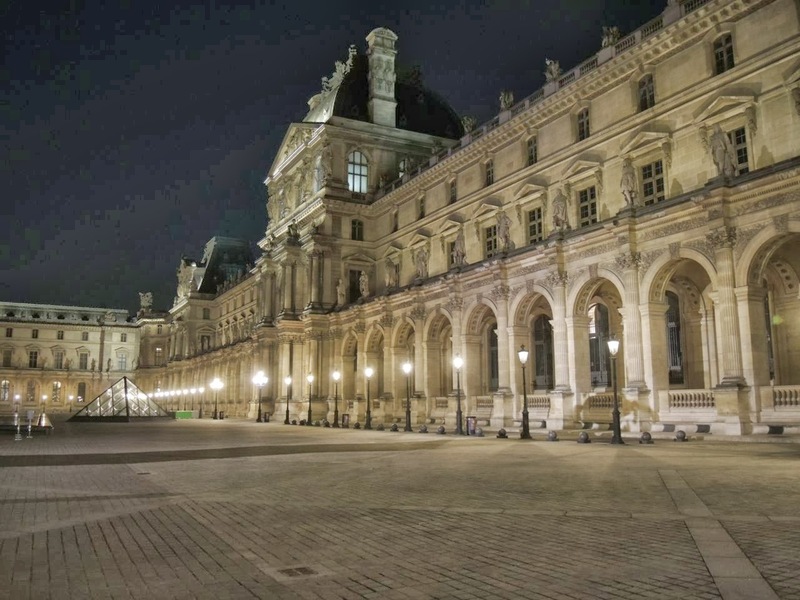 It is particularly striking when lit at night. 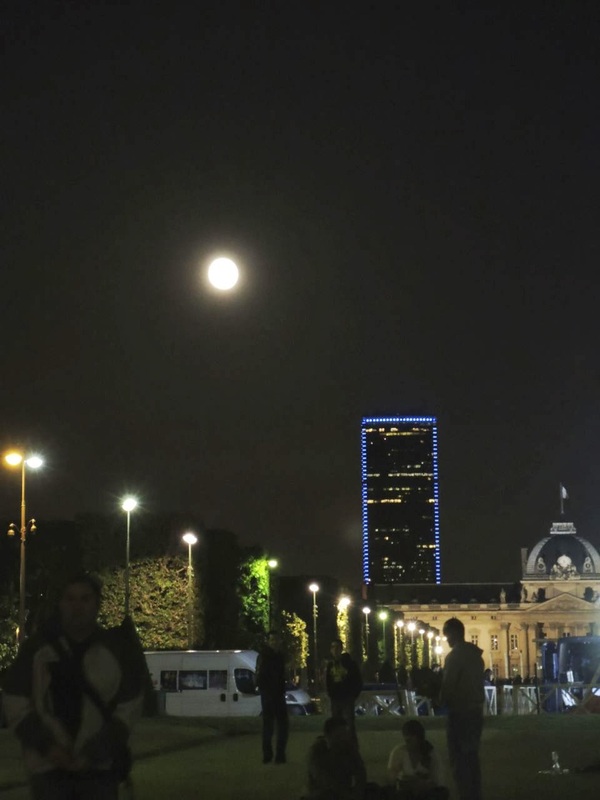 "Goodnight Moon, Goodnight Paris... until we meet again." 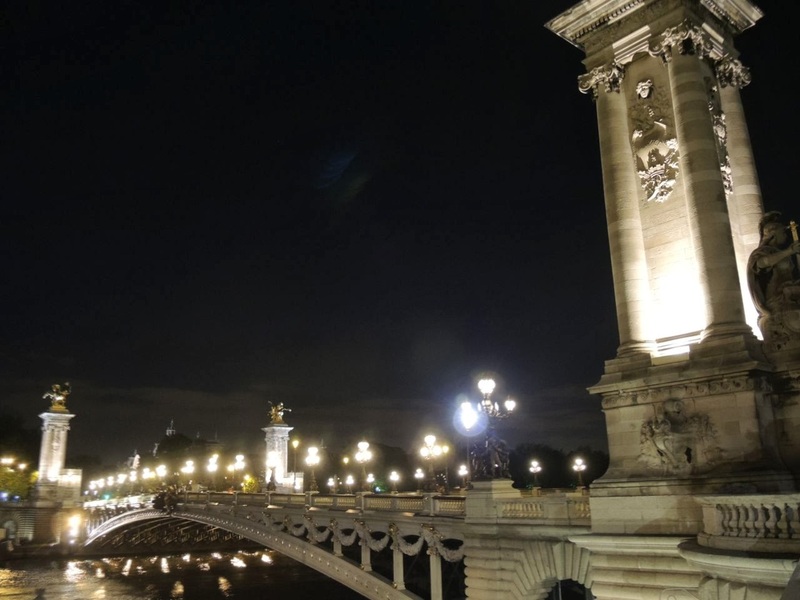 Paris has a magnetic pull on me. It is hard for me to visit Europe and not spend at least a little time there, so we ended our European holiday with a few days in the City of Light. I realize that is like saying if you visit New York, you must also go to San Francisco, which is ridiculous since the two are no where near one another. But I suppose once I make the effort to cross the big pond I feel I am in the neighborhood even if I am miles/kilometers away. Our only agenda was to eat as much pastry as possible. So, we did a Paris pastry crawl. It is not quite the same ambitious pursuit as running a marathon or doing a traditional pub crawl, but we attacked it with the same vigor. 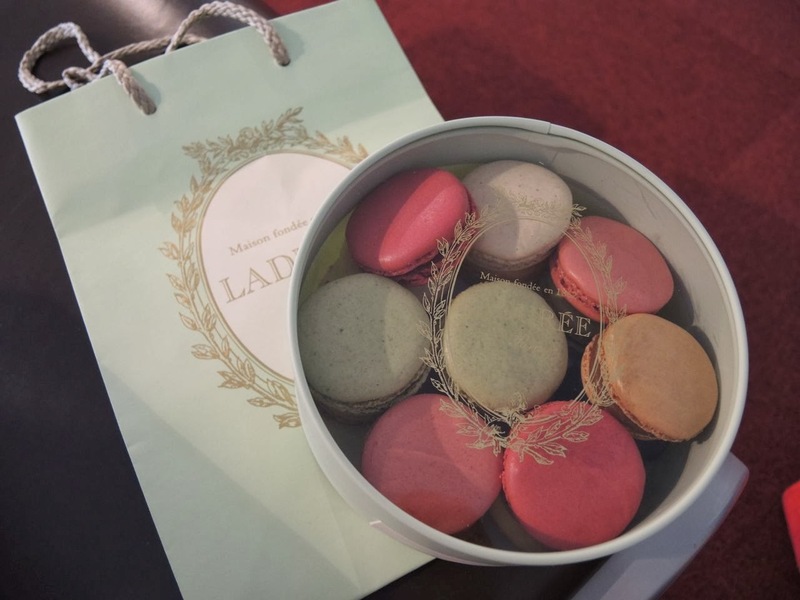 Our small hotel was conveniently located between Ladurée and Pierre Hermé, which is precisely why I picked it. Location, location, location. 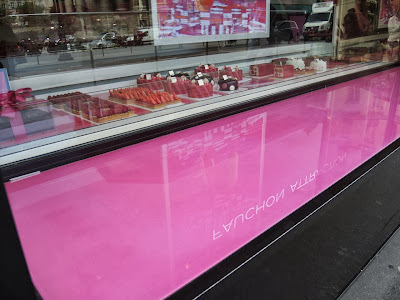 So many patisseries... so little time... We did not come close to visiting all the patisseries I would have liked to, but we did our best with the brief time we had, helped by a very useful app by David Lebovitz. 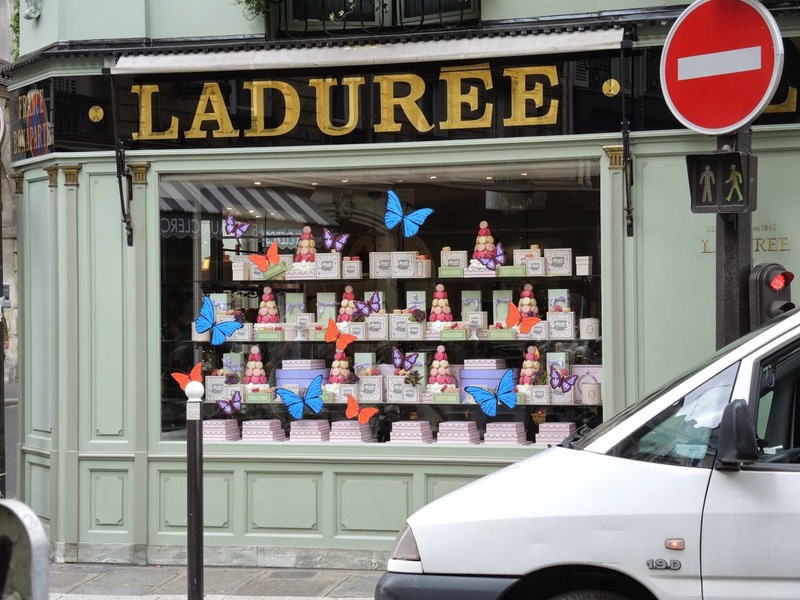 If you love pastry and Paris, this app is a winner. Even if you don't plan to visit, it will have you salivating from your armchair. Do check it out and his blog. Mr Lebovitz is such a clever and entertaining pastry chef and writer. Many years ago I worked for a design firm on a ferry boat in San Francisco. 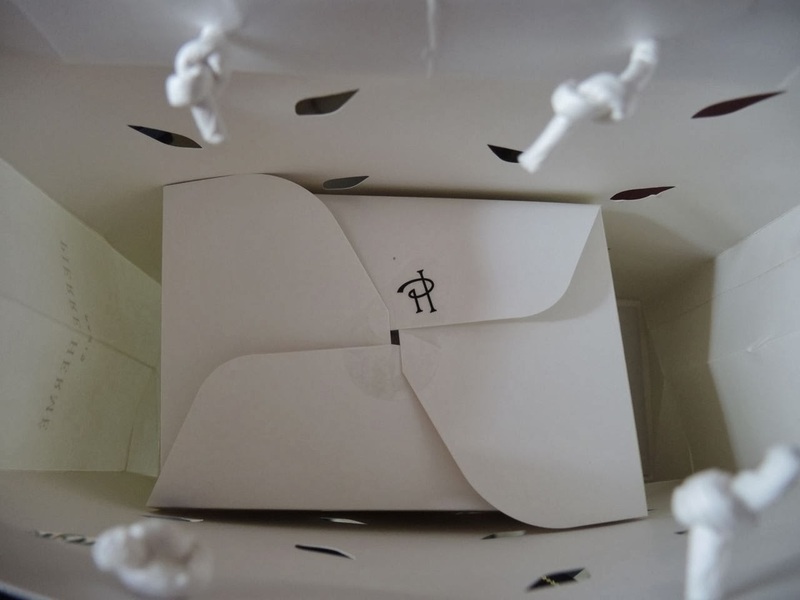 Meaningful logos, clever packaging, and stellar corporate images were our specialities. I believe Pierre Hermé has one of the most elegant logos I have ever seen. The interlocking PH is simple perfection. 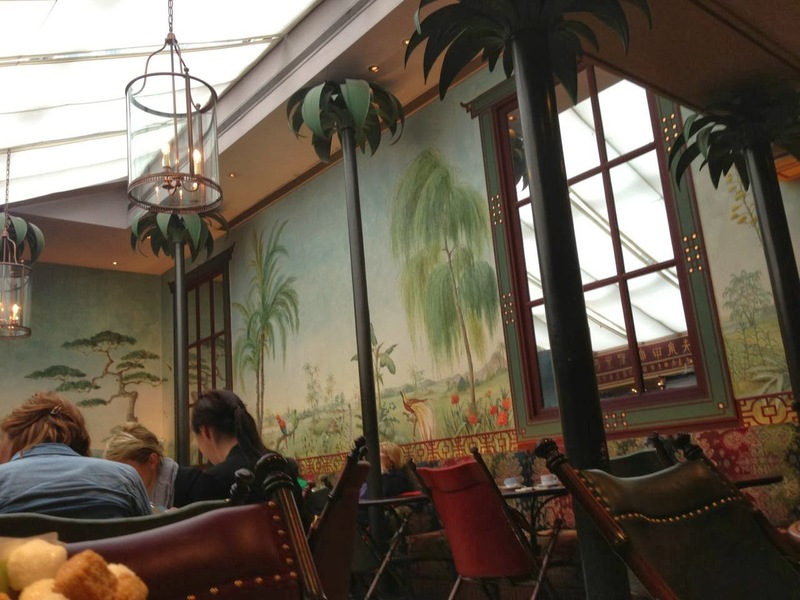 The French are experts at beautiful design and presenting their products in an intriguing manner. Fashion aside, never is this more true than in the patisseries. 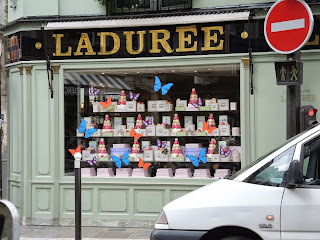 Ladurée, Pierre Hermé, and Fauchon elevate pastry to an art as do so many others that I didn't have time to visit. I think I need an extended research trip. When you step inside a Ladurée salon where every one speaks in hushed tones and the wait staff navigate the room with the precision of a ballet, you feel as if you have stepped back in time to a more genteel era. 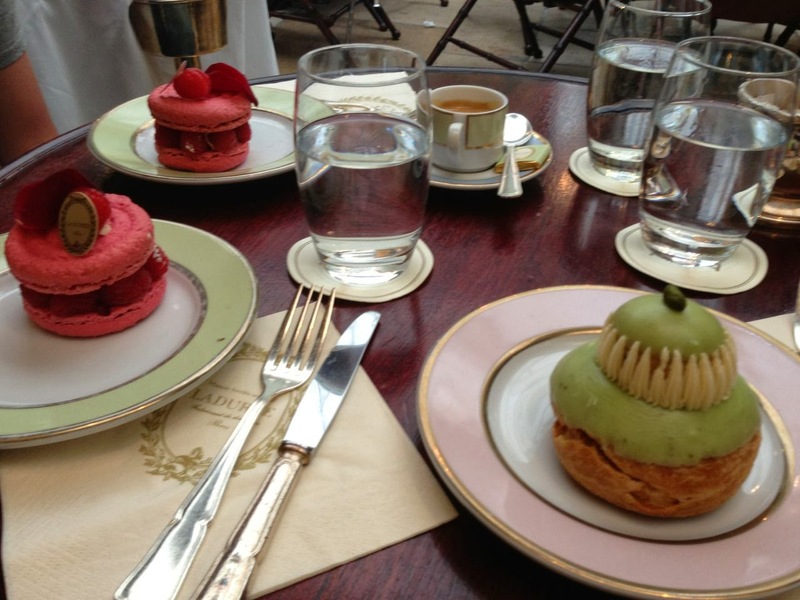 There is nothing more civilized than their delicious pastries and tea enjoyed on their beautiful signature china. Ladurée is a little slice of heaven. 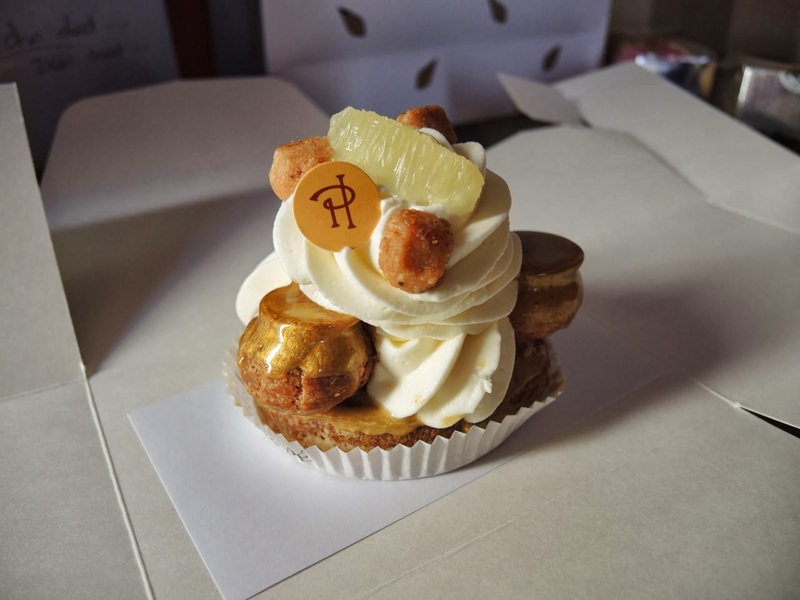 If you prefer your pastry to go you won't be disappointed as the treats will be expertly and handsomely wrapped to enjoy on a park bench while watching Parisian life. 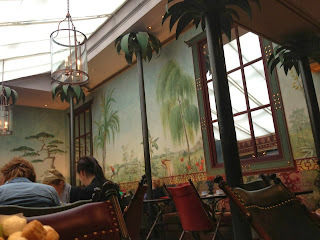 Palm trees and painted murals give the main room of Ladurée on rue Bonaparte a tropical feel. 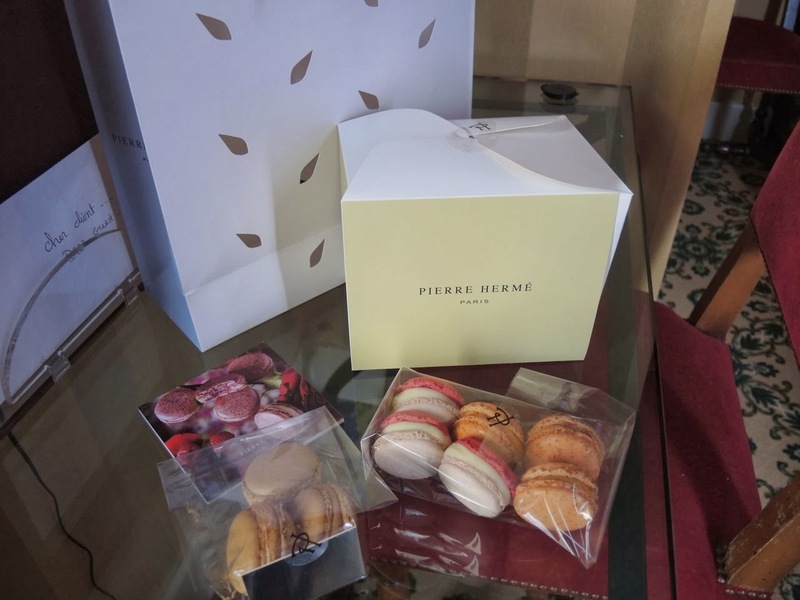 I would give just about anything to meet Pierre Hermé. 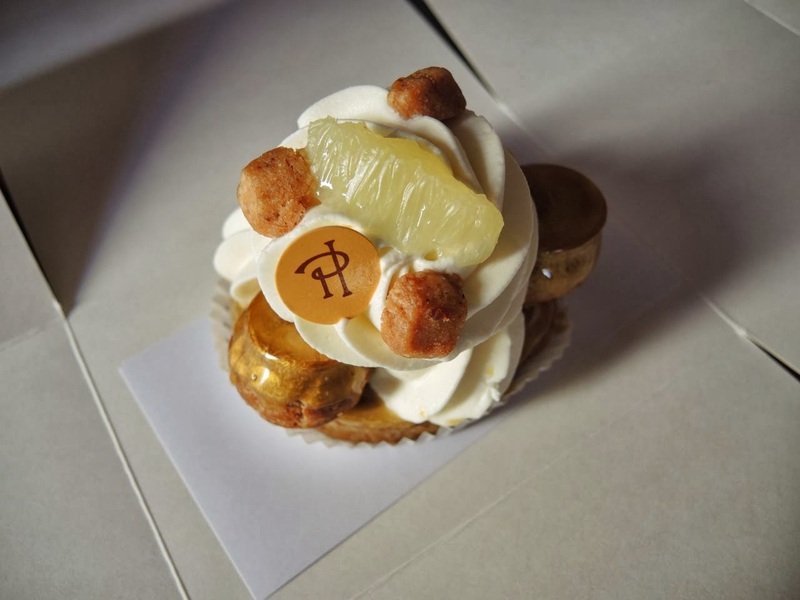 His pastry creations are a mix of traditional with a modern flair. I don't think anyone in the culinary world does this better or in a more interesting way. He is truly a pastry genius. I love his macarons for their generous fillings and clever flavor combinations. The Sainte Honoré citron (lemon) made me swoon. The caramelized sugar was a golden iridescent hue. How does he do it? 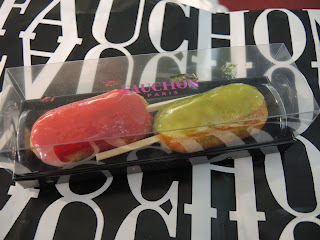 The pastries at Fauchon are displayed like fine gems in a jewelry shore.The colors and textures are a feast for the eyes. I once had a pastry teacher who encouraged us to 'steal with our eyes'. He said no one ever got in trouble for stealing with their eyes. Their pastries are truly inspirational. 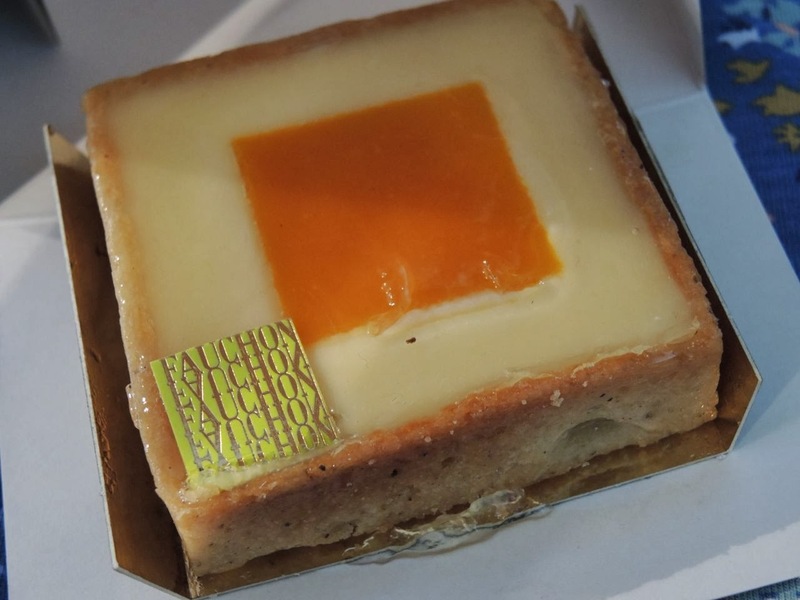 Always thinking out of the box Fauchon puts the traditional round lemon tart in a square mold. Delicious. Thankfully we walked a lot, which was needed to work off all the pastry research during our pastry crawl. Ah Paris, I long to cross the pond once more.